The best curling stones in the world are made from Ailsa Craig granite. All 64 stones used in the Sochi Winter Olympics 2014 were produced with the Scottish stone. The UKs 3rd largest gannetry is on Ailsa Craig and it’s a designated Site of Special Scientific Interest. It houses more than 73,000 breeding sea birds. 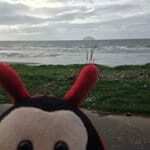 Do you have any more fascinating facts about Ailsa Craig to share with the Travel Bug?